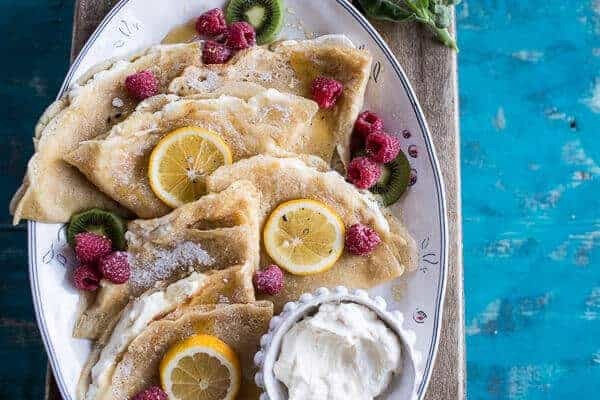 Lemon Sugar Crepes with Whipped Cream Cheese. I think it is official. My breakfast kick is kind of getting out of control…but I don’t plan on changing my ways anytime soon. I mean, everyone loves breakfast, right? Totally. Keeping things short and sweet today since, I am headed to the airport at a crazy early hour tomorrow morning and am of course, scrambling to finish things up before my mini vacation with the family. 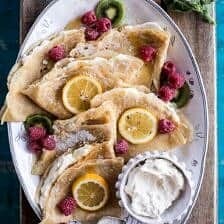 I was not planning on posting this recipe, but, after posting a photo of these Lemon Sugar Crepes with Whipped Cream Cheese on Instagram and Facebook, it was kind of clear you guys all really wanted the recipe! COOL! I created this recipe with the idea of remaking them for my family’s Easter brunch. However, I am now also thinking how perfect they would be for Mother’s Day. Especially since my mother happens to be a crepe fanatic!! These crepes are pretty extra special though. They are filled with some seriously amazing whipped cream cheese and then simply topped with lemon, sugar and honey. Nothing all that fancy, but still 100% delicious!! And so pretty too! I blame most of that on those fresh spring berries! FYI, I am so happy to have some berries back in my life. The fruit lover in me was having serious withdrawals!! So before I go, I have to ask, what are you guys making this Easter?! I clearly have BIG plans for breakfast, but I have to be honest, I haven’t really thought too much about dinner… or any savory foods for that matter – oops. Sweet foods are just so fun! To make the crepes, combine all the ingredients in a blender or food processor and pulse for 30 seconds to 1 minute or until well combined. Place the crepe batter in the refrigerator for about 30 minutes. This allows the bubbles to subside so the crepes will be less likely to tear during cooking. The batter will keep for up to 48 hours. Meanwhile, prepare the whipped cream cheese. Add the cream cheese and heavy cream to a mixing bowl. Using and electric mixer, beat on high speed until soft peaks form, about 5 minutes. Beat in the honey and vanilla until just combined. Cover and place in the fridge until ready to serve. To make the lemon sugar, add the ¾ cup sugar and the lemon zest to a high-powered blender or food process and pulse for about 30 seconds or until the sugar is very fine. Stir in the remaining sugar. Now lets make the crepes. Heat a 12-inch non-stick pan. Add butter or cooking spray (I like to use cooking spray) to coat. Pour 1/3 cup of batter into the center of the pan and swirl to spread evenly. Cook for 30 seconds and flip. Cook for another 10 seconds and remove to a cutting board. Lay them out flat so they can cool. Continue until all batter is gone. Makes about 10 crepes. 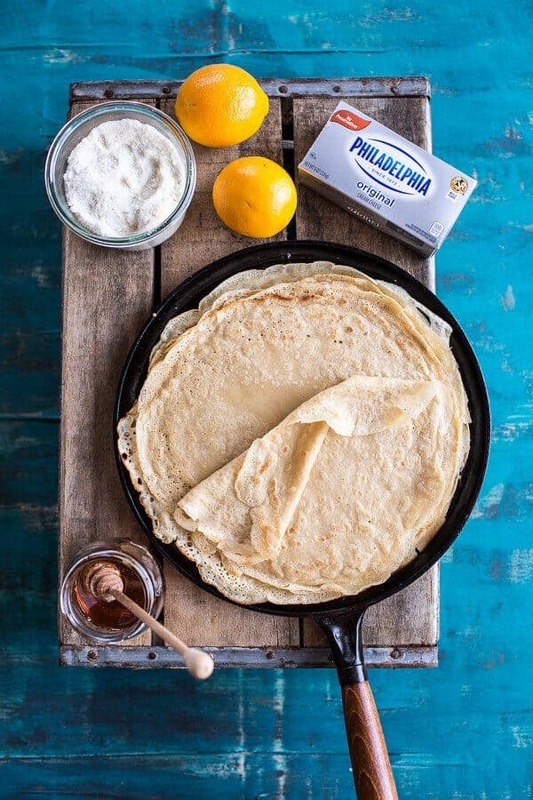 To assemble, spread the whipped cream cheese inside a warm crepe. Dust with the lemon sugar and drizzle with honey if desired. Serve with berries. FYI, I think I will be putting this lemon sugar on just about everything from now on. Amazing! 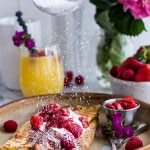 Lemon Ricotta Cheese Stuffed French Toast Crepes with Vanilla Stewed Strawberries. 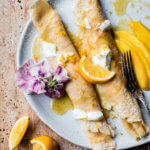 Meyer Lemon Chamomile Suzette Crepes with Greek Yogurt. 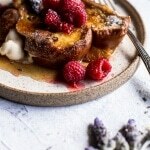 Whipped Cream Cheese Stuffed French Toast with Raspberries. 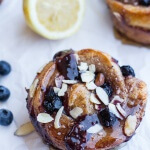 Vanilla Bean Blueberry Lemon + Cream Cheese Swirl Sticky Buns. What? Easter is almost here? Uh! Oh! Me thinks me better start working on my Easter menu. How did that sneak up on us? Well. . .one thing is for sure. . .these crepes need to be on my menu. I really want to try these! I loved the blood orange and mascarpone crepes you posted back in February and I think these would be equally delicious. These look beautiful!! Great job! Very mouthwatering!! I love your breakfast obsession!! Keep it up. Especially with recipes like this one. These look divine Tieghan! We love crepes in this house and I cannot wait to try these! Enjoy some warm weather with your family! 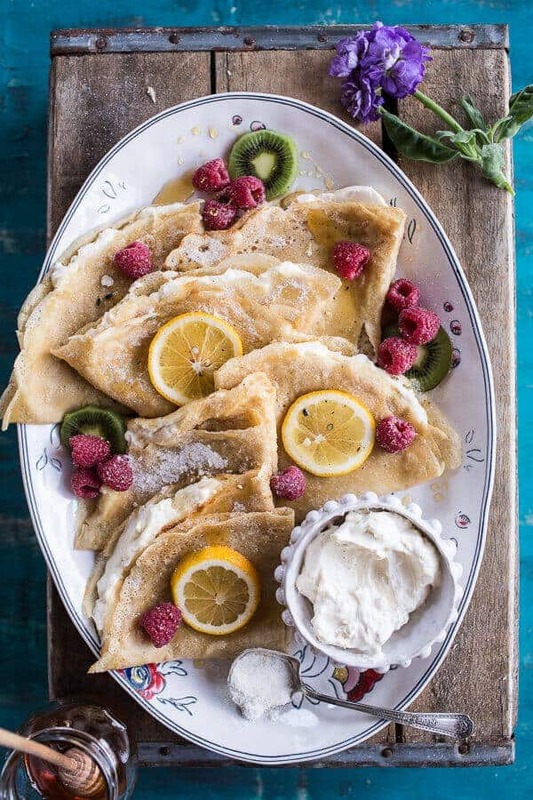 These look so beautiful….I’ve never made crepes but that may need to change….soon..have a great vacation we had snow again this morning in CT so enjoy some warm weather for all of us too. Love the looks of these crepes! 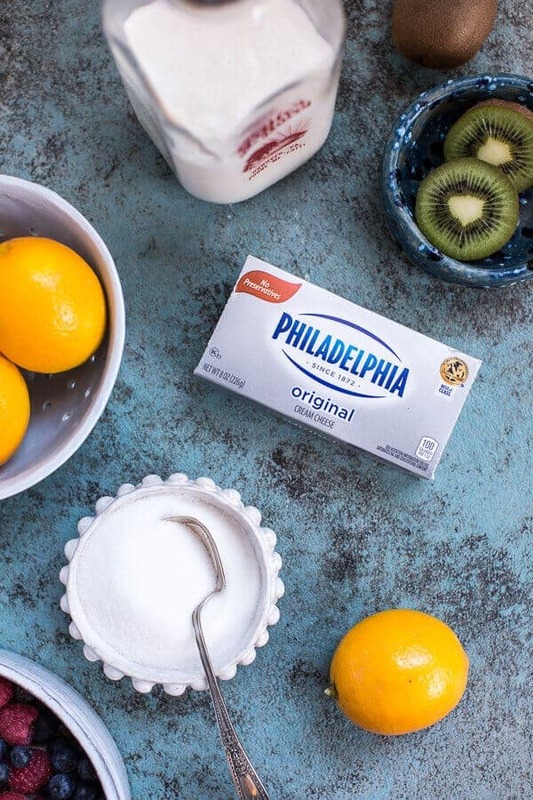 The lemon sugar sounds amazing, but I’m pretty much sold on the whipped cream cheese! Have a great trip! 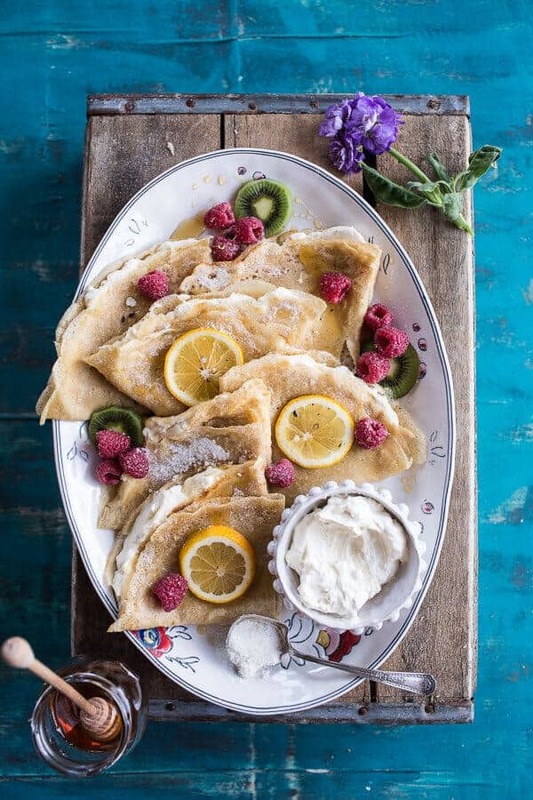 These crepes are just stunning, Tieghan! I want these for Easter brunch :). There’s nothing like a crepe slathered with honey and cheese, dotted with fresh berries! How delightful! I’ll add this to the queue! Beautiful! which is better, the whipped cream cheese or whipped mascarpone? I love either or, but whipped mascarpone is just a little fancier. if you like mascarpone, go with that!